Somehow, vegetables get a bad wrap when we’re kids, and then we have to learn to love them as we get older. In my opinion, if you don’t think you like most vegetables, you just haven’t had them a way you like them. Think of vegetables the same way you think of chicken. You don’t like chicken every way it’s served, but you probably like it at least one way. The great thing about vegetables is that you can pretty much stuff your face with them and, assuming they aren’t fried or doused in butter, your body will only benefit. From the recipe below, you might conclude that I’m into the Atkins diet, but you would be very wrong. Our adult bodies don’t need as much starch as our bodies did when we were kids because we aren’t in building-mode anymore; however, carbohydrates are an amazing energy source and should not be completely omitted from your diet. My approach to carbohydrates is to give them a supporting role rather than a leading role in meals. If I’m having a sandwich, I move all the insides over to one half of the bread. If I’m making pasta, I use a handle full of pasta to a pot full of meat and veggies. Using less noodles isn’t an option in a dish like lasagna because they are part of it’s structure; but, eggplant, zucchini or even portabello mushrooms are sturdy enough to make a delicious, healthy substitute for noodles. Aside from the positive nutrition exchange going from noodles to veggies, the switch out also adds flavor and will fill you up faster. Noodles on their own don’t have much flavor, and your body doesn’t have to spend much time processing them during digestion. Vegetables, on the other hand, are full of fiber and flavor on their own. Below is the exact recipe I used to make this dish last night. I tend to cook based on what’s on hand as opposed to planning out all my recipes. I never know what’s going to look fresh before I head to the store, so I just stock up on meat, vegetables and cheese, and then go from there. The kitchen is like my chemistry lab, but I get to wear cute aprons instead of a lab coat and goggles. Slice eggplant into 1/4 inch thick slices. Heavily spray a cookie sheet (you might need more than one) with olive oil. Spread your eggplant along the pan(s) and spray the top side with olive oil as well. Sprinkle with salt and pepper. Bake for 25 mins, flipping the eggplant halfway through the time. I spray the eggplant rather than tossing it in oil because eggplant is very absorbent and can soak up more oil than you want instead of being coated evenly when tossing. Cook your ground meat, and add it to the tomato sauce, diced tomatoes and tomato paste. Stir and cook to simmering. Combine ricotta, cottage cheese, 1/2 cup of grated parmesan, 3 egg whites, herbs, spinach and garlic. 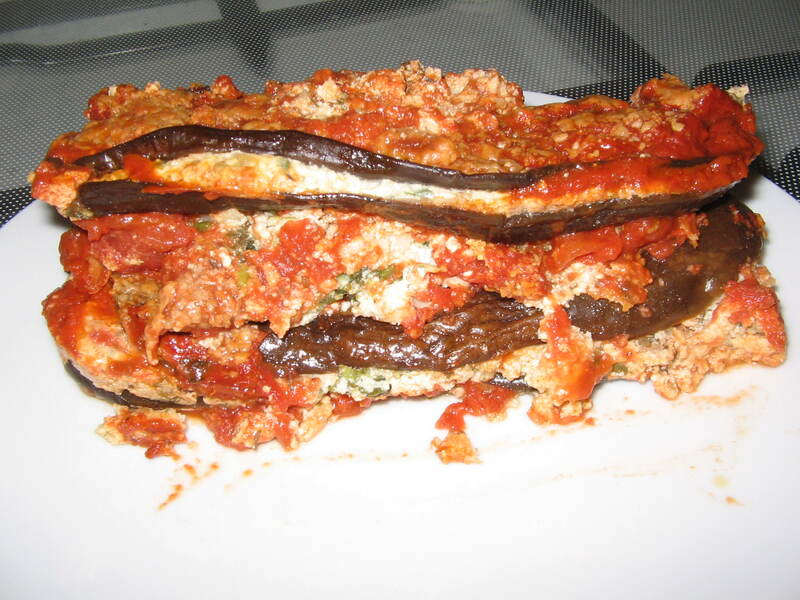 Spray your lasagna dish and layer as follows: Half the tomato sauce mixture, layer of eggplant, ricotta mixture, eggplant, sauce, remaining cheese. If you have enough eggplant, you can do more layers and just ration the other mixtures accordingly. Bake for 30 mins, or until the sauce is bubbly and the top cheese is a bit toasty.